Prof. of Practical Philosophy, Groningen (1660-1663); Prof. of Church History, Utrecht (1664-1670); Prof. of Church History, Amsterdam (1670-1690). Main works: Orator sacer: sive de ratione concionandi praeceptiones (1671); Orthodoxa fides: sive adversus Johannem de Labadie censura censurae Medioburgensis in libellum (Trajecti ad Rhenum, 1668). Bibliography: A.J. van der Aa, Biographisch woordenboek der Nederlanden. Deel 20 (1877); P.J. Blok en P.C. 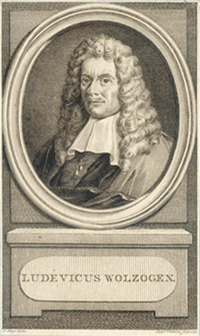 Molhuysen, Nieuw Nederlandsch biografisch woordenboek. Deel 10 (1937). Catalogus Instructissimæ Bibliothecæ Viri Antiquæ Nobilitatis D. Ludovici Wolzogen, à Missingdorff, Pastoris & Professoris Amstelodamensis ... Quorum auctio habebitur in aedibus defuncti ... Die 9. Aprilis 1691.... Amstelodami; Apud Abrahamum Wolfgangh, , 30 S., in 4°.